Carnegie Mellon University’s reach goes beyond its campus. One example is how every spring, students in Dietrich College of Humanities and Social Sciences’ Information Systems Program pair up with a community partner to develop technology applications to meet a business need. The partnerships allow students to gain real-world project experience while the organizations receive technical work they might not be able to afford otherwise. This year, 18 groups helped 15 organizations. Kenny Cohen, Sean Park and Emily Porat partnered with the Holocaust Center of Pittsburgh to take one of their many programs online. ChutzPow, a serious comic book re-telling of the stories of Holocaust survivors, was transformed to an online platform to provide an intuitive and seamless avenue for staff at the Holocaust Center to create and showcase the collection of stories and artifacts they have about the Holocaust. The team created a responsive web application that allows staff to create and edit stories with a few clicks. 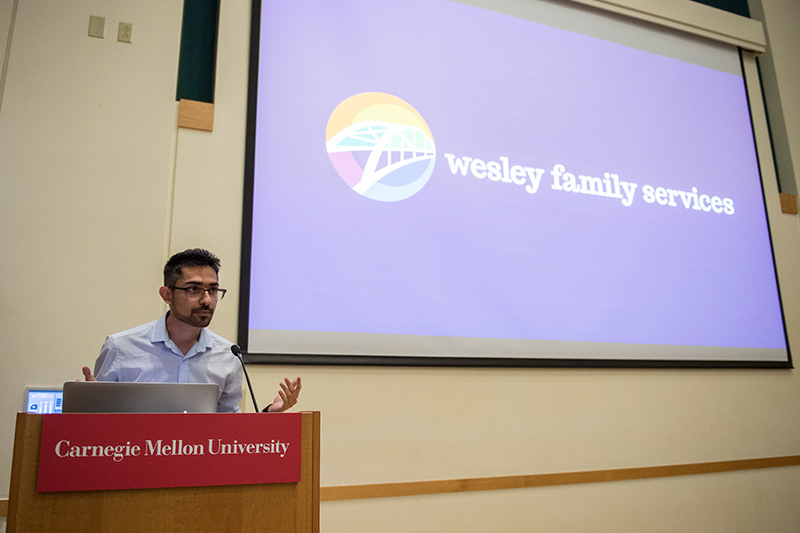 In the first of two partnerships, Wesley Family Services teamed up with Bernard Decelian, John Foley and Yingjing Lu to improve the company’s audit system. The students created a Sharepoint application complete with process, workflow design and training tutorials to improve the sustainability of the application. Through the application, users are able to easily import access records into the system. Process, workflow design and training tutorials are also provided to improve the sustainability of the proposed solution. Wesley Family Services also worked with Devansh Kukreja, Dylan Schwartz and Sally Zhao to create a management system for their vehicle fleet. The group created a Sharepoint-based system to keep track of all vehicle information from one online source. Previously, the information was spread out across three mediums. At Harrison Middle School, students use IKS Highlander & Mission Ops, a program that uses fiction, storytelling and STEM topic to simulate interactive missions for the students. CMU students Sydney Bauer, Renhao Hu, Isha Laad and Fletcher Marsh created a web application to collect the raw data from the IKS Highlander & Mission Ops. The team also generated a published page on IKS Highlander & Mission Ops’ website that shows the best visualizations and statistics from the web application. A non-profit committed to providing school supplies to in-need students, The Education Partnership needed a sustainable and manageable systems for their new STEAM kit lending library. In response, Alex Bainbridge, Walter Donnellan and Juliann Fields created The Education Partnership Lending Library Application, which allows teachers to select which kits they want to reserve and allows the staff to manage kits and export inventory reports. Along with the web application, the team created functionality training videos, templates for schools and users and other documentation for reference. The Education Partnership raises funds and recruits volunteers to provide basic supplies to students in local schools. Processing data each semester currently takes over three months and includes using Salesforce, a customer relationship management platform. To decrease time and costs, Stephanie Pang, Alina Yu and Shirely Zhou created a custom point of sales system called DataCat, which automatically pulls data from Salesforce and allows for input of sales to help streamline the process of reducing inventory of items in Salesforce as necessary. As the oldest grassroots environmental nonprofit in the state, the Pennsylvania Resources Council teaches classes to children and adults to educate them on their environmental impacts, including waste management. Arnav Gupta, Vinitha Ranganeni and Jonathan Wihl teamed up with the Pennsylvania Resources Council to implement an online application to facilitate data entry, management, analysis and storage in regards to the waste auditing process. Their online tool provides data collection and export tools and automatic data analysis and graph generation. Obed Appiah-Agyeman, Devin Fan, Pavan Gollapalli and Stephen Yamalis paired up with CMU’s University Libraries on behalf of the Oscar Micheaux Society, a scholarly interest group within the Society of Media and Cinema Studies, named after prolific filmmaker Oscar Micheaux. The team created a system that has been deployed on CMU infrastructure that hosts Oscar Micheaux films for download and streaming and allows students to upload their own film projects. The system has already been used by students to upload projects for a course. The International Living Future Institute (ILFI) is a non-profit organization that advocates for better building and product standards by shifting the focus from less harmful products to more environmentally regenerative ones. Shreyas Krishnaswamy, Arnav Jain, Karan Gugle and Manuel Lopez transformed the layout of ILFI’s Living Product Challenge, a framework for manufacturers to create environmentally-friendly products. The requirements of the Living Product Challenge have been housed in a PDF on their site. The team took that PDF and turned it into an online portal as an interactive way for users to learn about the program’s requirements. Chih-Sen (Jason) Chang, Youce (Andy) Ji and Svayam Mishra partnered with KidLift, a company that aims to help relieve the stress of busy parents by helping them safely transport their kids to where they need to go. Customers have been scheduling appointments through phone calls and text messages and could only register through paper forms, so the team revamped KidLift’s website design and integrated a scheduling system as well as designed a high-fidelity prototype to serve as a basis for future development. In need of optimized data organization, Phipps Conservatory and Botanical Gardens partnered with Ashvin Niruttan, Minnie Wu and George Yao to build a web application that has enabled them to tidy membership data. The application created has a dashboard where key metrics used by the membership team on a regular basis are displayed in an interactive manner. The application also has the capability to generate reports on unclean and duplicate data entries for the client to use in reviewing their database to remove unusable data. The Center for Sustainable Landscapes (CSL) at Phipps Conservatory and Botanical Gardens serves as Phipps’ education, research and administrative facility and is an integral part of the visitor experience. Real time data about Phipps’ buildings is available to staff through a site that was previously difficult to navigate. Justin Chang, Graciela Garcia and Frank Liao teamed up with Phipps to create a dashboard which presents CSL’s data in an understandable and educational way. The interface takes complex data and displays it in a meaningful way through animations, fun facts and videos. CMU’s Spring Carnival Committee (SCC) has used the application Binder as a way to keep track of content. Karan Bokil, Andrew Kim and Ritika Srivastava teamed up with SCC to build on top of Binder to meet needs of the committee. The team implemented a feature for booth chairs to add builders to their organization, they corrected a formatting issue with reports and they integrated the Google Calendar API in order for tasks to be more flexible and managed. Additionally, they introduced a feature to allow SCC’s treasurer to convert unreturned tools into charges through the click of a button. Wanting to consolidate their learning modules and resources into a comprehensive learning plan, CMU’s Professional Development Services teamed worked with Shubhangi Bhotika, Andy Lee and Julien Naegeli to generate the web application CompetentU. CompetentU allowed users to take surveys on various professional skills and then develops a learning plan to help them improve their skills. The team also made it so future developers can add multiple functionalities to further maximize the application’s potential. The application was deployed on CMU’s Campus Cloud Plus hosting service. CMU’s University Contracts Office (UCO) reviews all legal agreements for purchases made with third-party vendors. To assist in this process, Dylan Hyun, Julia Luo and Linda Xia created a web application that performs versioning, a comparison of differences between software agreements by highlighting additions in green and removals in red. The application saves agreements into the application database as well as allow for other features like software search, side-by-side document comparison and commenting. The Beaver County Humane Society is home to roughly 250 animals and helps around 4,000 animals annually. The humane society has been using paper donation forms to process all donations. Dexter Epouhe, Siting Jin and Arnav Luthra built a web-based application that streamlines the donation process at the shelter. The form was made so that donors can input personal information and their donations on a kiosk when they donate at the humane society. The information gathered from the kiosk feeds into a basic inventory management system which allows the organization to keep track of the quantity and value of their inventory. Kodiak Island Borough School District’s Kodiak Lab is a part of the National Oceanic and Atmospheric Administration’s (NOAA) Shellfish Assessment Program, which seeks to assess the distribution and abundance of commercially imported crab resources in the eastern Bering Sea. Connor Fitzgibbon, Hera Miao and Rich Zhu created a web application that can read image files from the Kodiak Lab folder directory, place the images into a game for students to analyze and push the collected data to an application programming interface that can be accessed by NOAA and the Kodiak Lab. CMU Athletics’ training staff is in charge of the overall well-being of the varsity athletes on campus while optimizing players for peak athletic performance. Winston Chu, Alex Lam and Aathreya Thuppul set up a user-friendly series of application that tracks numerous variables (sleep, fatigue, hydration, etc.) and monitors the health and performance of athletes. The data analytics done by the application is based off of research done in the sports-medicine industry in order to provide optimal metrics for the department. The application is available via desktop and mobile devices. Pictured: Devansh Kukreja talks about the work his team did for Wesley Family Services.